Deep-sea thrills enliven this sequel to Stevenson’s well-received debut, Torchlight (1997). Stevenson III, a relative both of his namesake and also of Hart Crane, has done much treasure-diving off New England, including over 20 dives to the Andrea Doria. Thus, he knows whereof he speaks when his underwater heros, ex-Navy SEALs Philip Drake and Jack Henderson, are first seen while entering that doomed oceanliner. This prepares us for the bigger job ahead: the recovery of a defense satellite fallen into the Atlantic, off the shore of Maine. 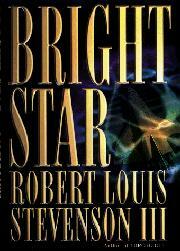 The satellite, called Bright Star and created for the defense industry by William Lawrence, the black genius who heads Systems Technologies, is capable of launching a thousand laser beams at once, wiping out enemy forces in one megablow while also creating a defensive nuclear shield. But before Bright Star is launched into orbit, the nuclear stealth submarine Trident is hijacked by terrorists. While the shuttle Atlantis bears Bright Star 200 miles aloft, a massive computer failure shuts down the Johnson and Kennedy Space Centers and Atlantis sinks into the ocean 50 miles off Bristol, Maine—not far from the missing Trident. Drake and Henderson manage to dive about the floating shuttle and rescue two crewmen before Atlantis sinks toward the ocean floor, while Jack Henderson dies, impaled by a speargun—and Bright Star becomes bait for the Trident terrorists. Will the terrorists sell Bright Star to—well, China?—with Bright Star going operational for the unfriendly nation within weeks? What is Drake’s best ploy for saving his country from the misuse of Bright Star? The answers, my friend, are blowing in sea currents that have the force of express trains. With every item of hardware identified by its spec number, this Clancy clone has its own energy and tension while, in the murkiest depths, fresh chills arise page by page. Not new, but well done indeed.